The Surge takes a new well-established formula and throws it into a blender with an added touch of sci-fi goodness. This isn’t your typical SoulsBorne game (of the Dark Souls / Bloodborne style). From the developer of 2014’s Lord of the Fallen, The Surge takes on the same kind of gameplay, though places the player in a dystopian world with sci-fi and futuristic weapon types, instead of the high fantasy setting we’ve become accustomed to. You play as Warren, who is on his first day at a new job. On top of this, the game presents to you right at the beginning something that is rarely explored in video games. 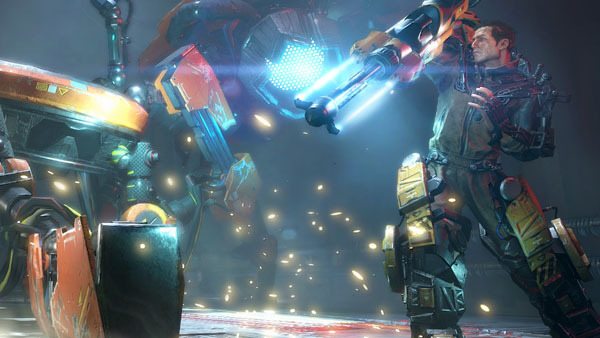 You have to navigate the first section of the game in a wheelchair, this kind of vulnerability instantly shows the weight of the company that Warren is going to work for, as well as how the exo-rigs that you will be equipped with play a pivotal role in the game as a whole. After the small intro and a bit of an accident with the procedure of fitting the exo-rig to Warren, you’re thrust straight into things in a junkyard on the outskirts of the city. This is where you are given some simple tutorials on how to play and are left to find your way through the enemy infested badlands. The first thing to note here, while The Surge plays like a SoulsBorne game, everything is slightly different with small mechs having precise lasers and unpredictable movement behaviour. The combat is also where the game really shines, with the ability to strip enemies of body parts to unlock new weapons and armour schematics. When coming face-to-face with a foe you’ll have the choice of choosing what to hit: Blue body parts act as a weakness to do more damage, whilst yellow parts give the chance to drop more salvageable items. This makes each encounter a bit of a dance, figuring whether you want the quick kill or some shiny new gloves. Later in the game, certain enemies will also drop implants. These act as a stat boost for Warren, giving increased stamina or an injectable health recovery. 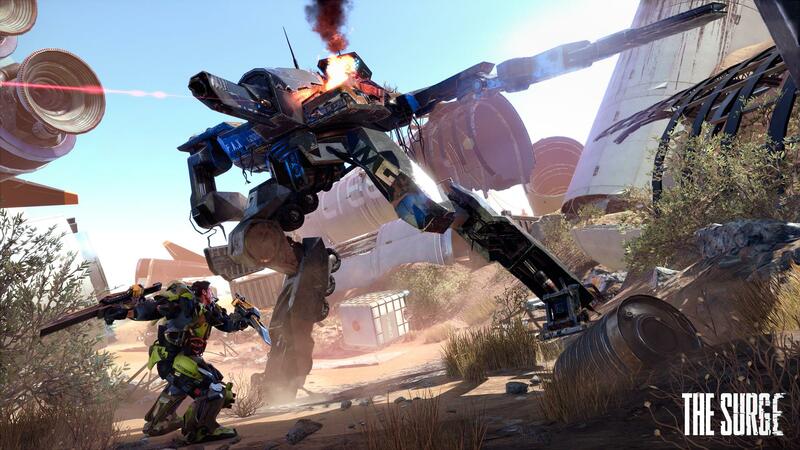 As with every game in this genre, it’s all about the combat, The Surge really takes this on board and manages to keep things fresh in an age where there are now a lot of these types of games out in the wild. Boss fights also have an interesting spin, while they range from hulking mechs to standard security personal. There are little touches that make each encounter a challenge yet equally a visual spectacle. At times I found looking for certain attack patterns turned into screaming as a ran for my life at the last second. The mechanics all add up for some exhilarating battles and make the bosses themselves quite memorable. While the game itself is hard to start with, players familiar with the SoulsBorne games will already know and love the challenge that this brings. Despite this, there are major issues when you hit a certain point in the game and come against certain enemies, the aggression increases in their attacks and some even one-hit kill you. Even being way over the level I needed to be the difficulty spike was a little too high and I found myself getting frustrated more often than I have done in a game like this before. Going back to the things I do like about The Surge, because really there isn’t much I can give a negative comment on, the world itself is built in such a unique way. Different settings have their own feel and personality. Ranging from huge and expansive factories to desolate executive offices. Each different area has its own shortcuts and secrets waiting to be found, some of which show how bad things have become in the world. At times I had to keep checking what was behind me with how eerie some of the settings felt. Unfortunately, with some of the settings, it can get a little confusing as to which way is up. The factory area for one gave me a bit of a headache with its layout. It’s also in the tight areas that I had multiple game crashes once a few enemies built up, like the game couldn’t quite process how much was happening in such a small space. The Surge takes some well-known tropes with the established genre and adds a new spin to it. The combat has some interesting kicks that make it fresh compared to similar games, though with the huge difficulty spikes it’s hard to take into account the main attraction of the game when it turns into more of a survival of one attack. For anyone who wants to dive into something that has the SoulsBorne mechanics in a fresh new world setting then look no further than The Surge, if you can get past some of the minor issues you’ll find the game to wholly enjoyable. The Surge is rated M for Mature and PEGI 18 as it contains blood, strong language and violence. This review is based on a digital review copy of the game provided by the publisher for the purpose of this review. Brigitte is Now Live on Overwatch!